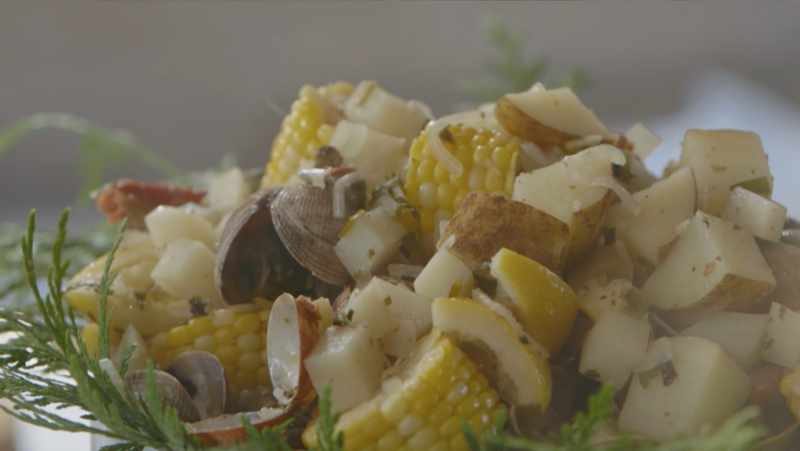 Very few words are as comforting as, “clambake”! With an open flame and a Dutch Oven, Art makes one feel good dish. This is the sort of dish that doesn’t have leftovers. This is a one-pot dish designed to be cooked on an outdoor fire in a Dutch oven but will also work in an indoor oven using heavy duty oven wear. • Heat up Dutch oven against the flames of your fire and add 3 T of the butter, stock, onions, garlic and potatoes, cover with lid and allow to steam until potatoes are half cooked (about 10 mins depending on heat). • When spuds are ready add corn, place lid back on Dutch oven and cook ingredients for 5 mins. Add more stock if liquid is running low, as the vegetables have to steam. • Then add the clams, raw salmon fillet, wine, salt and seaweed and allow to cook until clams begin to open and salmon starts to turn pink. • Remove from heat, add the smoked or candied salmon as a topping, place lid back on and keep the clambake warm at the fire’s edge. • Just before serving, strain the liquid from the pot into a saucepan and add 1 cup of butter, the fresh herbs and whisk over medium heat.